Complete Injector Cleaning & Flow testing - $22 per injector. Injectors are externally cleaned, visual inspected, and numbered. Test injectors for resistance, shorts, and current draw. Perform leak test, spray pattern, resistance while operating, and flow testing, (both pulsed and static), on one of our flow benches. Our modified test machines are set up specifically for various types of injectors. The test results are recorded. Remove filter baskets, o-rings, pintle caps, etc. Bead-blast paint and rust from the metal injector body. The injectors are placed in our first ultrasonic cleaning tank to remove any particles, grease, etc from the exterior that may contaminate the next two cleaning processes. Into the second temperature controlled ultrasonic tank they go, the injectors are now cycled on and off allowing the ultrasonic energy to dislodge any particles and build-up inside the injectors. The injectors are now placed in our third ultrasonic tank for additional cleaning using a different cleaning solution. Once again they are being cycled on and off while being cleaned. This three tank, two cleaning solution cleaning process insures that any particles or contaminates are removed. A high pressure back-flush is now done to remove any remaining particles inside. Back to the flow bench for retesting of spray pattern, flow rate, coil resistance, and leak checking. If any injectors still are not flowing well, they will go back through the cleaning process and retested as many times as needed. This test data is also recorded. Prepare a comprehensive test report with before and after test data. The injectors are then packed along with the old parts for return. 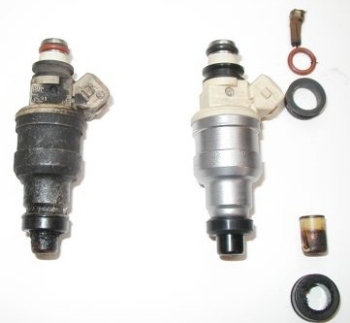 Here's the before and after photo of a typical injector. The old parts on the right have been replaced. - Please contact us if you require these, or have other special requirements. We post the current turn times on the home page.